One of the joys of digging around in Arsenal’s past is finding a photograph or an article that looks reasonably interesting and then, on further investigation, reveals a ripping yarn. I came across the photograph above whilst looking through a collection of Alf Fields’ ephemera recently purchased by Paul Matz. 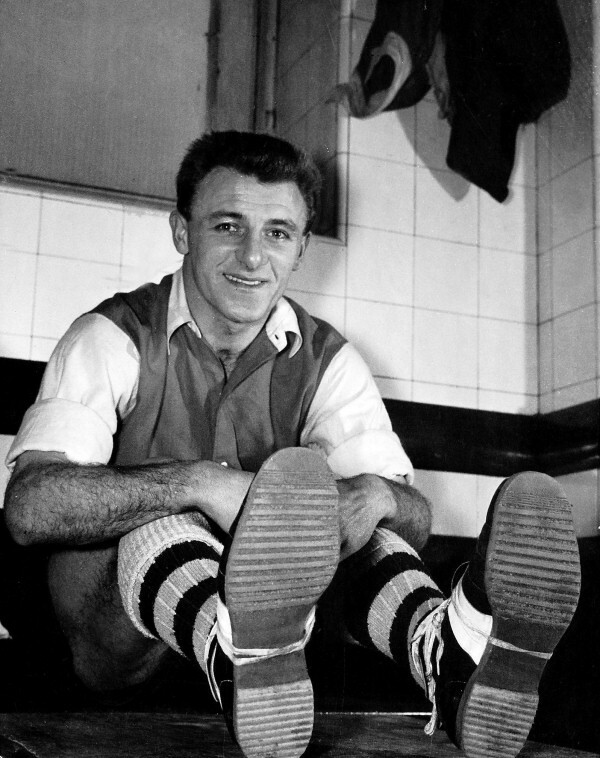 It shows Tommy Docherty wearing what looks like a pair of trainers rather typical football boots. The text on the reverse, however, indicates that these were match-worn boots. My spider senses started tingling as I thought to myself: “Why are the press making a big deal about the boots that an Arsenal player was wearing?” The answer was in the weather in January 1959 and Arsenal’s innovation in attempting to overcome it. In the fourth round of the FA Cup the Gunners had been drawn away at Colchester United. It seemed a formality but the home team from the Third Division proved incredibly resilient before succumbing to two quick goals after 75 minutes. Against all odds they then pulled themselves back into the game with goals in the 80th and 88th minutes to force a replay, and bumper payday, at Highbury. In the lead up to the replay the following Wednesday, London was hit by a cold snap that turned the Highbury pitch into something resembling an ice-rink – this being before undersoil heating was installed. And this is where Tommy Docherty’s boots come into play. They were lightweight boots with a crepe sole which, in theory, would help the Arsenal players keep their feet in the icy conditions. 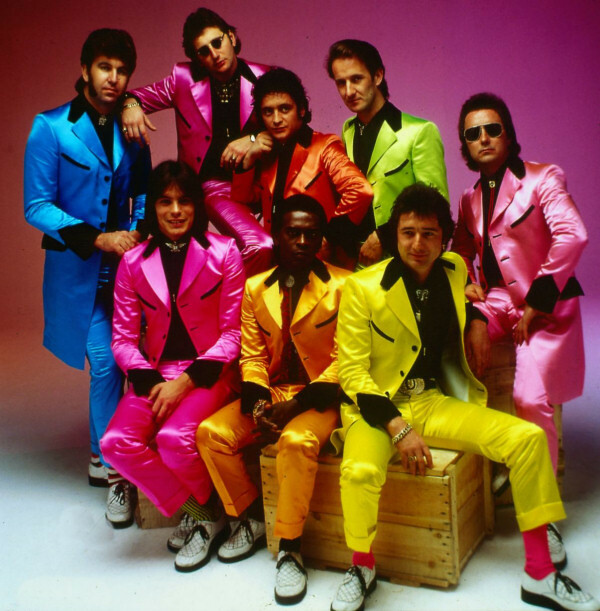 Those of you of a certain age will remember the Teddy Boys of the 1950s, or the 1970s revivalists, who wore crepe soled shoes, commonly known as “brothel creepers.” Arsenal’s innovative boots were made from the same material. The players had worn them twice in training and they appeared to work. Centre-forward David Herd didn’t seem particularly impressed and chose to stick with his tried and trusted studs. The outcome was that the boots were a resounding success. 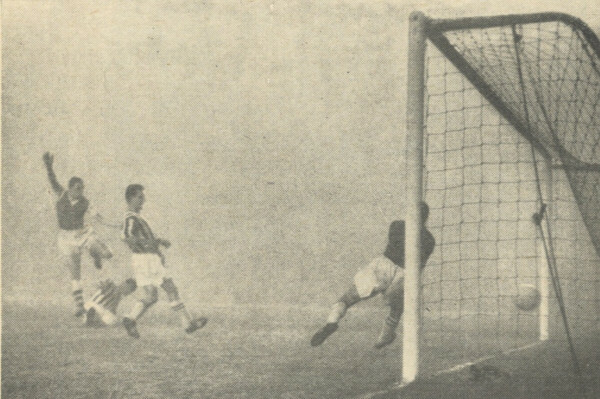 Arsenal took the lead after 18 minutes when Herd converted Dave Bowen’s cross from 20 yards out. That was how it remained until half-time although Vic Groves missed a glorious chance to double the lead. It didn’t take long for Herd to score his second, this time from a Len Julians cross. The game was put beyond doubt with 20 minutes remaining as Julians latched on to a long ball from Bowen and smashed it into the corner of the net. A minute later Groves was upended in the penalty area by Percy Ames, and Dennis Evans converted the spot kick. There was no hope of a Colchester comeback this time; Jack Kelsey had to find other ways to keep himself warm as he had not one save to make. Arsenal’s 4-0 victory showed that the players had no problems with the icy conditions, except for Herd who struggled to stay on his feet. Despite this, he still managed to score twice – how many would he have scored with crepe soles? But the story does not end there. Whilst the players made the headlines on the back pages, the fans made it onto the front pages. During the previous summer, Jack Crayston had resigned as Arsenal’s manager. He was replaced by George Swindin, another former Arsenal player, who had impressed in charge of non-league Peterborough over the previous four seasons. 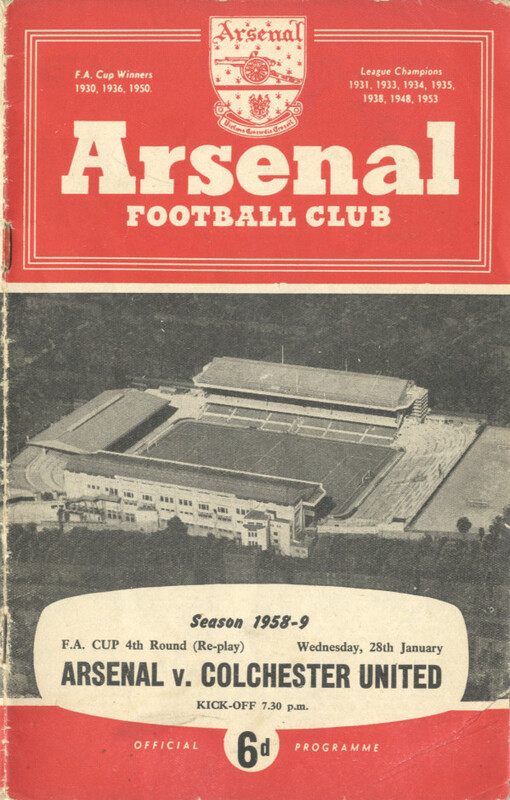 With Swindin at the helm and Ron Greenwood as his right-hand man, it appeared that the Gunners had woken from their five-year slumber and looked to be genuine title contenders. At the time of the Colchester game they had returned to the top of the First Division table, having led it for six weeks earlier in the season. Barring a couple of odd instances at the start of the season this was the first time Arsenal had topped the table since they won the title in 1952-53. A huge crowd turned up for the replay, despite it being a midweek game, and against a lower league team. However, a signalling fault on the Piccadilly Line had caused the line to be shut down between Covent Garden and Arnos Grove for more than half an hour, resulting in thousands of fans missing the kick off. And when they did get to the ground they found that the gates had been closed with more than 62,000 packed inside. Outside, tempers started to fray and a large number of fans decided to gain a vantage spot in Aubert Court, the flats behind the Clock End. Some broke down the door to the roof, whilst others rang on residents’ doorbells to ask if they could watch the game from their balconies. It was estimated that 300 fans crammed into the flats before, eventually, being cleared away by the police. There was talk that the boots might be used for the next game, against Tottenham, but the cold weather abated and this proved to be the only time that the crepe-soled boots were worn by Arsenal. As for the rest of the season, it all fell apart in the following round of the Cup. A 2-2 draw at home to Sheffield United was followed by a 0-3 defeat in the replay. This was due to Kelsey sustaining a broken arm just ten minutes into the game. With no substitutes, let alone substitute goalkeepers, back then Dennis Evans pulled on the green jersey and Jack played on the left wing with his arm in a sling! Matters were exacerbated when Danny Clapton also picked up and injury and Arsenal were, effectively, playing with nine men. The Gunners remained top of the table with ten games to go when they were hammered 1-6 by eventual champions, Wolves. They never recovered from this and eventually finished fifth. This article was first published in issue 572 of Gunflash. This type of article is invaluable when we try to explain the tradition of THE ARSENAL. No other club has the Title “The Invincibles” and no other club can say that they have never been out of the top division. An elderly relative of mine once said that in his days ( the 30`s ) Arsenal were known as “The Guards” of English football. Their reputation has always set them apart from other clubs as something special. It is interesting in these days when the importance of fans is somewhat degraded by the financial input of TV. When you read articles like this and understand the passion and commitment of the fans which still endures today it is arguable that the fans are still the real lifeblood of the club. 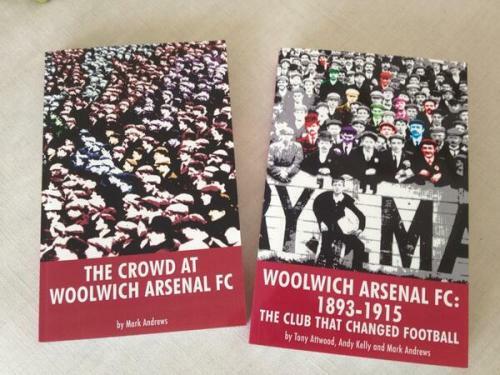 Thanks Andy , another really fascinating article which brings back many memories .It is incredible to think that so many attended when a very average side was nearly six years into the barren time between 1953 -1970 . I can also only wonder whether Tommy Docs boots would prevent so many of today’s injuries .